What’s the deal with the JNUC product sessions? While community-led sessions have and will continue to be the bread and butter of the JAMF Nation User Conference (JNUC), we want to offer you more by introducing a new track of product sessions. JAMF product experts are set to conduct deep-dive demos, provide insight into newly released features, and shed light on the direction and strategy of our products. What sessions will be available? Glad you asked. Learn how to eliminate the burden of procuring and maintaining hardware while scaling your environment securely through the use of JAMF Cloud. See how JAMF’s new patch management solution automates the patch management processes and helps you confidently keep your environment up to date and secure. Learn how to utilize JAMF to greatly simplify the processes associated with device enrollment, app deployment, classroom configuration, and Apple ID management. Discover how to leverage the latest version of JAMF Self Service to redefine the end user experience and reduce IT support costs. Be one of the first to see the JAMF 2016-2017 product strategy and initiatives. See what’s on the horizon, what it means for your organization, and how to prepare. Learn how you can leverage JAMF and native Apple technology to make your environment more secure with enterprise-grade encryption, settings management, and patching—all while maintaining the end user experience. See how to better utilize JAMF Nation and discover the resources that are available to help you build knowledge, solve problems, and get the most out of Apple and JAMF. What else will these sessions cover? 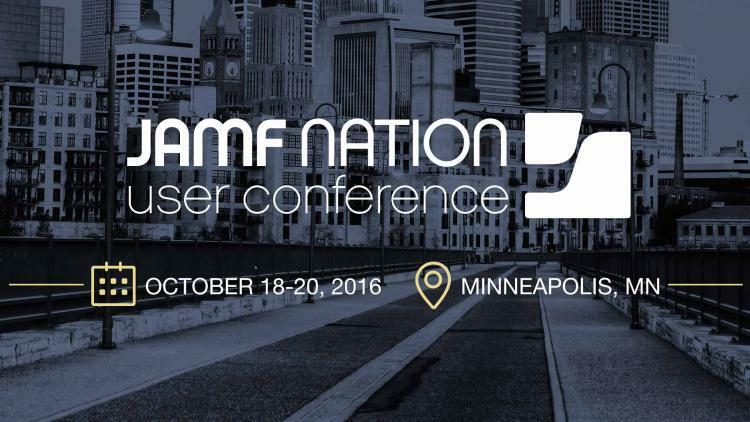 Get more details on the JAMF-led sessions and be sure to lock in your seat for this year’s event. Psst—just between you and me—we’re well on our way to another sellout, so I’d register sooner rather than later. Plus, the earlier you register, the better the price.